Yes, 20. And yes, any one can destroy your retirement because all 20 are inexorably linked, a house-of-cards, a circular firing squad destined to self-destruct, triggering the third great Wall Street meltdown of the 21st century, igniting the Great Depression II that George W. Bush, Ben Bernanke, Henry Paulson and now President Obama have simply delayed with their endless knee-jerk, debt-laden wars, stimulus bonanzas and bailouts. So how do we make sense of this and what can we hope for after the meltdown? One of the best pieces of analysis I have seen – and without a doubt the most positive – comes from Carlota Parez – Author of Technological Revolutions and Financial Capital: The Dynamics of Bubbles and the Golden Age. She has seen this all before – the financialisation of the economy, asset price inflation bubbles fuelled by speculative debt and ultimate crash – not once but 4 times since 1770. In her opinion we are half way through a 5th cycle that is following the same dynamics as the previous four cycles. If she is right – and we have sufficient energy and an ecosystem to support us – we should emerge from this in what she calls a “golden age” of wealth redistribution off the fruits of the infrastructure investments made since 1971. But we need the crash first and we will need to see re-regulation of finance and the end of the belief that the value of the stock market equates to economic growth. And by the by – for all of us in Australia who still believe that house prices will continue to go up for ever – and its somehow different here – she predicts that house prices will once again become affordable. Apart from her though leadership interview, there is an excellent slide presentation of her ideas of the golden future of growth after the crisis at slideshare . Check out these three charts – they have a lot of similarities don’t they. They aren’t exactly the same but very similar. In a sense they both measure the same thing but in different ways. 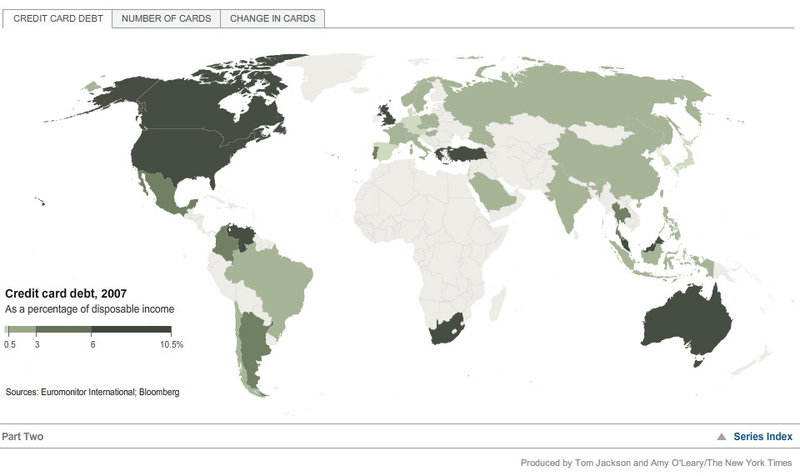 Credit card debt is a predictor of ecological debt and the common link is democracy. Democracy may be a wonderful thing but has delivered an economic growth rate that is unsustainable.